Astrophotographer Jeff Dai took this self-portrait in the Himalayan mountains of Tibet, China, on Oct. 7, 2016. 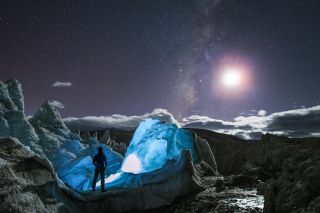 When astrophotographer Jeff Dai set out to see the stars shining over giant Himalayan glaciers, he stumbled upon a scene that looked more like an alien planet than an earthly landscape. Tall, jagged glaciers glow bright blue beneath the Milky Way galaxy in one of the photos from Dai's excursion through the Himalayas. He captured the image on Oct. 7 in Tibet, a region in southwest China. You can see more awesome Milky Way photos here. "The winter Milky Way was dueling with zodiacal light," Dai told Space.com in an email. Other sights that night included the constellation Orion, a nebula named Barnard's Loop, the bright star Sirius, the Andromeda galaxy and the Pleiades star cluster, Dai said. Mars is visible to the left. Towers of ice, called seracs, surround Dai in this stunning self-portrait. Seracs form in places where crevasses, or large cracks in a sheet of ice, intersect and cause glaciers to break. The icy peaks can be as big as a house. Dai said that he planned the photo to show "a comparison of human and serac, showing how great the serac is." The glacier in Dai's photo isn't really blue like it appears in the photo. Dai suspects that the camera settings combined with his own outfit caused the cool color effect to appear. "I'm thinking it's due to my blue jacket and white balance," he said. Seracs may be big, icy beauties, but they can also be physically unstable and dangerous to walk on. To Dai, the potential hazards were worth the spectacular selfie and other photos he took there. Dai also created an incredible virtual-reality 360-degree panorama of the starry sky and the Milky Way illuminating the Himalayan glaciers. He even captured a few Draconid meteors in the panorama. Editor's note: If you have an amazing night sky photo you'd like to share with us and our news partners for a possible story or image gallery, send images and comments in to spacephotos@space.com.